This story starts, as many great stories do, in a basement, when Drew Wolf and neighborhood friend Larry Klebanoff set out to create a very different kind of company. And while the business they co-founded, League Collegiate Outfitters, began as an apparel company in an already overcrowded market of collegiate apparel manufacturers, from the outset, the company set out to distinguish itself. One way it has achieved that is through its wide range of high quality, vintage-inspired sportswear that has proved highly popular on college campuses nationwide. Another way is in the care that League takes of the very people who make that apparel. Eighteen years later, having partnered with Central American University to build an impressive array of employee programs ranging from childcare to free meal programs, Bolaños believes the approach he’s taking at the LCA factory, located near the capital of San Salvador, is winning a war against crime, poverty and hopelessness. “When we opened our factory here, I think people thought we were crazy to want to try to rehabilitate gang members, or offer our workers a childcare center, or special living accommodations for handicapped workers,” Bolaños says. However, the steps League has taken have brought great results. Ironically, with over 15 percent of the workforce now comprised of rehabilitated gang members, it’s served to make the work community safer, and once stabilized, Bolaños encourages self-improvement. Surprisingly, rather than recoup their investment in training life-long employees, the workers at LCA are instead encouraged to pursue careers outside of the company with more earning potential — or even to start their own businesses. 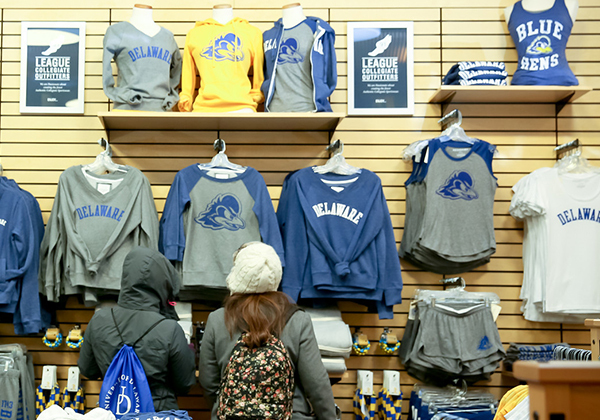 League Collegiate Outfitters apparel is displayed in the Barnes & Noble at University of Delaware campus bookstore. 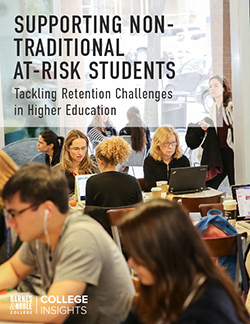 It’s an employee model that impresses Barnes & Noble College’s Vice President and Chief Merchandising Officer, Joel Friedman, and has enabled League to be the exclusive suppliers of the company’s Red Shirt proprietary brand. “How our partners treat their employees is something that has always been very important to us — and what’s particularly remarkable about League is that as they help their workers to become more productive citizens, allowing them to move up in society. League can then go back into the community to rehire for those positions to help even more members of the community,” he says. Bolaños is particularly proud of the difference he sees in children, who would have previously been recruits for one of El Salvador’s notorious gangs. 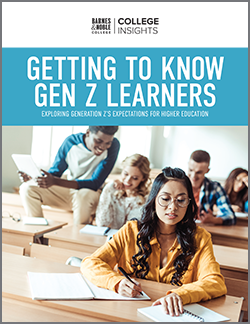 “When you can go to them and say that when you finish school, you’ll have a job with us and access to college — what happens is the whole community is transformed,” he says. Bolaños gives the example of a local school, which now has zero student dropouts, and whose pupils now feel they have a future. When he is asked what these enlightened employee practices do for a company like League, Bolaños says this, “We get our production out on time, our employees now have hope and it becomes more like a family.” He also says that while having an impact at a local level, what League is doing is also helping to develop the country as a whole. “They win — absolutely,” Friedman says. “Their employees benefit — and we benefit with the kind of quality merchandise we can stock in our bookstores and offer to our students. It may very well be a humanitarian model, but it works on every level,” he says. 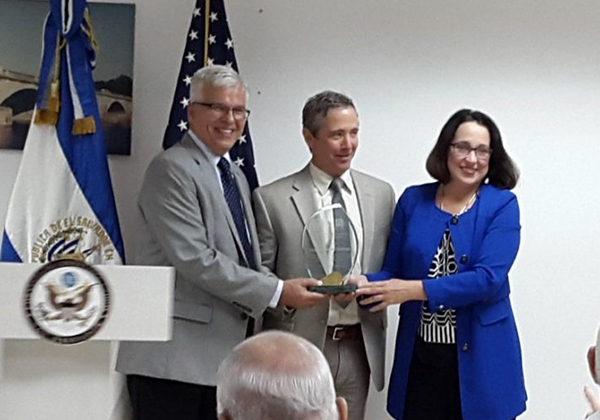 LCA President Rodrigo Bolaños and League co-owner Larry Klebanoff receive the U.S. Secretary of State’s award for Corporate Excellence-El Salvador from United States Ambassador Jean Manes. With merchandise now in over 1,600 schools, and manufacturing out of two production centers, League has come a long way from that Philadelphia basement, but it’s been more than just a business success story. The company has recently been presented with the U.S. Secretary of State’s Award for Corporate Excellence-El Salvador, the FIRST Award for Responsible Capitalism for educational and hiring programs, as well as by the Financial Times ArcelorMittal Boldness in Business Award for corporate responsibility/environment. “They’re open and unafraid to try new things,” Friedman says, “and that resonates with our students. We have a whole new generation on our college campuses who are continuing to expand their interest in social issues. For them, giving back is critical — and I just don’t see that going away anytime soon. If anything, it will become more and more powerful,” he says.